7mm smooth round Ice Flake Quartz look like crackled ice, caused by rapid heating and cooling of clear Quartz Crystal. The large (approximately 12x18mm) flat oval Ice Flake Quartz are capped in Sterling Silver hand made in Bali, with 3mm crystal accents. The 2 3/8" Deluxe Floral crucifix and 1" Ribbon Edge Miraculous Medal center (NOTE: this crucifix and center have been discontinued. 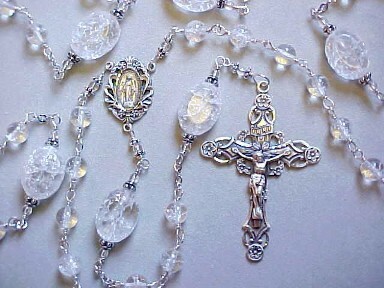 They are replaced by the set on Rosary #37, Designer Collection 8) are satin finished sterling silver with engraved highlights. All wire, chain and findings are also Sterling Silver. 7mm Rose Quartz and large (approximately 12x18mm) flat oval Rose Quartz. Beautiful rosary for an August birthday! 7mm freshwater pearls in a pistachio color combine with gold foil lampwork beads with pink and blue flowers and green vine. The draped Miraculous Medal center and Deluxe Streamer crucifix are satin finished sterling silver with engraved highlights. All wire, chain and findings are also Sterling Silver. 6mm Pink Coral (*see note below) with 8mm Lampworked glass which has an aqua core with pink roses sealed under clear glass, capped in Bali Silver with tiny Mother of Pearl and Turquoise accents. (NOTE: The Our Father beads shown are no longer available. They have been replaced by the flower beads shown on #9. 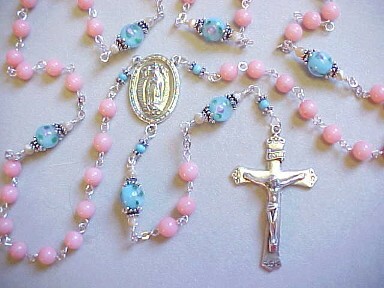 Aqua Crystal or Amazonite will be used in place of Turquoise) The 1" Our Lady of Guadalupe center and 2" Flower tip crucifix are in-stock parts in cast Sterling Silver and are available only as a matched set. All wire, chain and findings are also Sterling Silver. The 4 flowers on the crucifix represent Our Lady's 4 apparitions to St. Juan Diego on the hill of Tepayac outside of Mexico City. The pink coral represents the color of her dress. The aqua glass represents the color of her mantle, with pink roses to symbolize the roses she requested Juan Diego to take to the Bishop, and the unbleached Mother of Pearl represents Juan Diego's cloak of rough hewn fabric upon which Our Lady caused the miraculous image to appear. NOTE: There are over 2,000 varieties of Coral around the world. It is formed by the Calcium Carbonate secretions of small sea creatures called polyps, some of which are free swimming and some of which are anchored to other material in the Coral Reefs. This Coral from the Pacific Coral Reefs is naturally grayish white. It is dyed pale pink to vivid crimson red, giving it the same appearance as more expensive Italian Coral, which is naturally colored from the Mediterranian Sea. The Italian Corals rarely grow bigger than 3-4mm. 8mm translucent white Snow Quartz combine with 10mm Lampworked Glass beads that look like old time snow globes with swirling white, and a pink flower on both sides of the bead (NOTE: the Our Father beads shown were discontinued and have been replaced by a very similar bead), capped in Bali Silver and clear Crystal with pink Quartz accents at the crucifix and center. The 1" Radiant Mary center looks like a gigantic snowflake behind the standing image of Mary, and the 2 1/4" large Openwork crucifix are hand cast Sterling Silver reproductions of antique rosary components, available only as a matched set and only by special order. 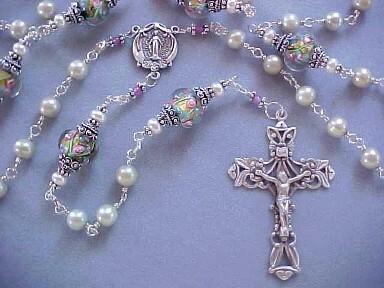 If you want your rosary made with these special order heirloom rosary parts, please see the "how to order" page. All wire, chain and findings are also Sterling Silver. In August of 358, Our Lady appeared to Pope Liberius and also to a wealthy Roman couple telling them that she wanted a church built on Esquiline Hill. She promised to send a sign. The next morning, snow had fallen on Esquiline Hill. The wealthy couple donated the money to build the church and it was blessed by the Pope. This design is also available with 7mm white Italian Onyx for the same prices. Available in 5 different gemstones - see list below! 7mm Hematite, charcoal-black with a mirror-like finish, combine with 8mm Hematite capped with handmade Hill Tribes silver and 4mm Hematite. 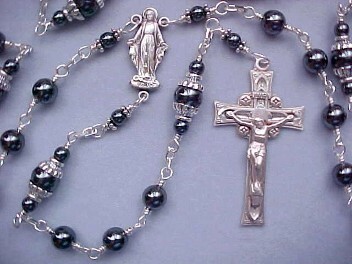 This rosary has a nice weight to it, due to the high Iron content in Hematite. The 2" Blocked Crucifix and 1" Our Lady of Grace/ Miraculous center are satin finished sterling silver with engraved highlights. All wire, chain and findings are also Sterling Silver. 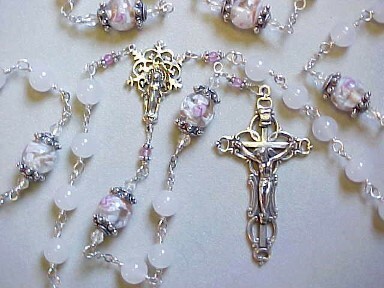 This style rosary is also available with 7&8mm Black Tourmaline, or 7&8mm Garnet. Price will vary according to stone selected. Please inquire.